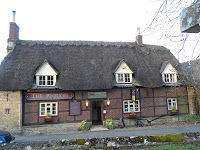 It was a cold, blustery, dark and eerie evening when I met 23 members of the Cheltenham branch of the Federation of Small Businesses for a stiff drink at the Plough Inn, Prestbury in Gloucestershire. Were we warming ourselves, chatting too much or just nervously 'raising the spirits' in preparation for our ghost walk? 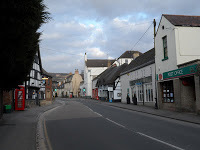 It was during the Civil War in 17th century that Oliver Cromwell had arranged for many of his officers to be billeted in Prestbury village. Some of the enemy had an encampment at nearby Sudeley Castle. Cromwell and his men knew that from time to time messages would be sent from the camp to Royalist troops who had besieged the nearby city of Gloucester and he ordered an ambush to be prepared in readiness. As expected, a King's messenger was spotted galloping towards Prestbury on route to his destination. Cromwell's men heard him coming, raised the alarm, and moved in to attack. The messenger saw what was happening ahead and spurred his horse into a faster gallop. Clods of earth flew from the horses hooves; the messenger was travelling so fast it was impossible to capture him. However, what he didn't see, until it was too late, was a fine wire stretched between two trees across his path. With an agonising scream he hit the wire so hard that his head was completely severed from his body. The head, spouting blood, bounced to the ground first, followed by the grisly remains of the twitching corpse, while the terrified riderless horse galloped on. From that day onwards, locals have often heard the disembodied clatter of hooves of a galloping horse along the road outside the pub. The eerie sound has been attributed to the soul of this headless horseman. After an hour or so we returned to the The Plough in need of another drink to settle our nerves. We were served with a piping hot meal and, gathering around the tables, we listened to Cathy as she told us of her experiences with the invisible, mischievous and often troublesome pub poltergeist.